Haroon Bashir claimed 6-26 for Nassington against Peterborough Town. Nassington seamer Haroon Bashir destroyed his former club Peterborough Town in a Rutland Division One game yesterday (July 19). Bashir ensured Town’s reply to the home side’s 199 started in the worst possible fashion by taking the wickets of Chris Milner and Marcus Howard with the first two balls of the innings. From 0-2 Town did recover slightly thanks mainly to youngsters Kyle Medcalf (33) and Kieran Judd (22), but there was no stopping Bashir who finished with 6-26 as Town were shot out for just 91. 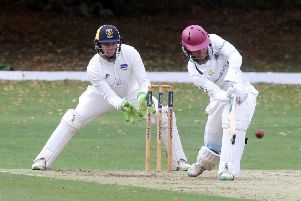 Kiwi Ryan Duffy (74) had dominated Nassington’s innings before becoming one of five victims for teenager Connor Parnell. The maximum 20 points was enough to send Nassington soaring up the table, but it’s unlikely anyone will catch leaders Uppingham who hold a massive 63-point lead the top. Uppingham bounced back from their first defeat of the season at Wisbech last weekend to thrash Bourne by nine wickets. Alex Ashwin bagged 6-50 as Bourne were shot out for just 115, of which Jordan Temple struck 42. Barnack’s fine season continued with a six-wicket win at Eaton Socon. The local villagers have only lost once all season - they have two games in hand on Uppingham - and they were too strong for Socon thanks mainly to all-round excellence from skipper Mohammed Yaseen who followed a 2-27 spell with the ball with an innings of 89 as Barnack reached their victory target of 177 with plenty in hand. Stamford won by 12 runs at Wisbech with Andrew Hulme (92) again in the runs. Stamford’s 210 remained just out of reach of the Fenmen despite 49 from Gary Freear and 41 from Josh Bowers. Alex Birch (4-46) bowled well for Stamford and dad Chris (2-25) didn’t do badly either. Stamford 210 (A. Hulme 92, A. Birch 41, S. Prentice 20, G. Freear 4-65, T. Meyrick 2-30). Wisbech 198-9 (G. Freear 49, J. Bowers 41, D. Haynes 38, J. Esser 28, A. Birch 4-46, S. Prentice 2-12, C. Birch 2-25). Town 91 (K. Medcalf 33, K. Judd 22, H. Bashir 6-26). Eaton Socon 176-6 (T. Banks 38, M. Yaseen 2-27). Barnack 179-4 (M. Yaseen 89, M. Shahid 23). Bourne 115 (J. Temple 42, R. Bentley 35, A. Ashwin 6-50, T. Wharton 2-24).